The BSB Thermal Housing has been designed to slow down the influence of elevated temperatures generated during a fire condition on damper actuators, extending its operational life allowing the damper to function in temperatures up to 300°C for two hours. The thermal housing is made from an advanced phenolic composite resin with endothermic properties and is provided in two parts, the base and the cover and can accommodate the PM – spring return actuators. 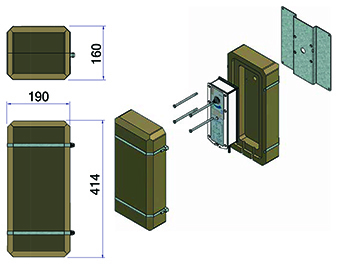 The thermal housing is unique in that no gaskets or additional seals are required thus eliminating the possibility of damage or misfitting during commissioning and/or the maintenance programme where the actuator would normally be checked. Weight without actuator 3.3 Kgs. Download the relevant documents below.